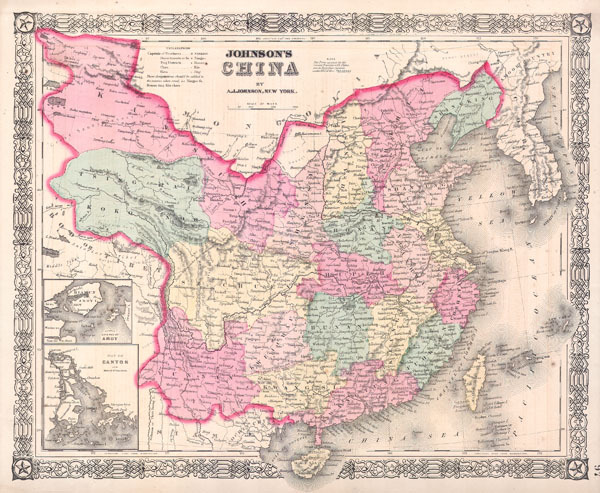 This is A. J. Johnson's 1865 map of China. Covers the region with particular attention to cities and waterways. China at the time this map was made was mostly closed country, however, a few ports were opened to western trade, these are noted in capital letters and include Tanchau, Kaifung, Waingan, Shanghai, Canton and Nanking (Nanjing) among others. Insets detail the 'Island of Amoy' and Canton (Hong Kong). Features the Celtic style border common to Johnson's atlas work from 1863 to 1869. Steel plate engraving prepared by A. J. Johnson for publication as plate no. 97 in the 1865 edition of his New Illustrated Atlas… This is the first edition of the Johnson's Atlas to exclusively bear the A. J. Johnson imprint. Johnson's New Illustrated Family Atlas, (1865 Johnson and Ward edition). Very good conditon. Text on Verso.